The newly released Environmental Working Group‘s (EWG’s) 2014 guide to safer sunscreens has a new goal: to encourage consumers to take charge when it comes to sun safety. As always, the EWG’s 8th annual guide to sunscreens offers shoppers an easy-to-use, searchable online database of the safest, most effective sun protection products. However, because rates of skin cancer are rising, not declining, this year EWG has also launched a Sun Safety Campaign. According to the new campaign, “More than 2 million Americans develop skin cancer each year. [Plus more] Americans are being diagnosed with melanoma, the deadliest form of skin cancer, at steadily spiraling rates. Over the past 35 years the rate of new melanoma cases among American adults has tripled, from 7.89 per 100,000 population in 1975 to 23.57 in 2010.” According to the new safe sunscreen guide, a full 2/3 of the sunscreens analyzed by EWG researchers don’t work well enough or contain ingredients that may be toxic. In good news, the 2014 guide shows that there are more safe zinc- and titanium- based mineral sunscreens on the market than ever before, and these choices do offer stable, lasting protecting from UV rays without penetrating the skin with horrid chemicals. Keep reading to see some of EWG’s top 2014 picks for safe sunscreens. 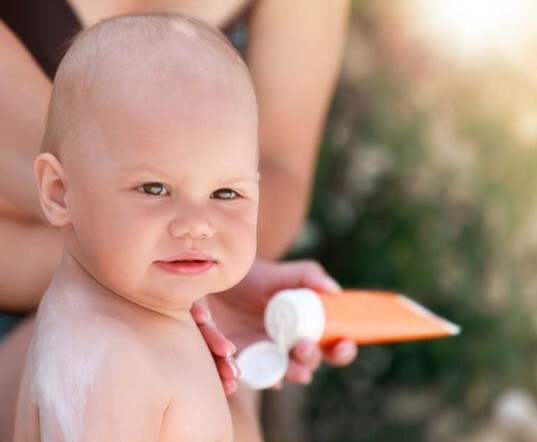 The newly released Environmental Working Group's (EWG�s) 2014 guide to safer sunscreens has a new goal: to encourage consumers to take charge when it comes to sun safety. As always, the EWG's 8th annual guide to sunscreens offers shoppers an easy-to-use, searchable online database of the safest, most effective sun protection products. However, because rates of skin cancer are rising, not declining, this year�EWG has also launched a Sun Safety Campaign. According to the new campaign, "More than 2 million Americans develop skin cancer each year. [Plus more] Americans are being diagnosed with melanoma, the deadliest form of skin cancer, at steadily spiraling rates. Over the past 35 years the rate of new melanoma cases among American adults has tripled, from 7.89 per 100,000 population in 1975 to 23.57 in 2010." According to the new safe sunscreen guide, a full 2/3 of the sunscreens analyzed by EWG researchers don�t work well enough or contain ingredients that may be toxic. In good news, the 2014 guide shows that�there are more safe zinc- and titanium- based mineral sunscreens on the market than ever before, and these choices do offer stable, lasting protecting from UV rays without penetrating the skin with horrid chemicals. Keep reading to see some of EWG's top 2014 picks for safe sunscreens.